I’ll try to do some proper accounting once I cash out from Indiegogo but for now, below is a summary of what we’ve raised so far, including proceeds from our Christmas markets and other direct donors. 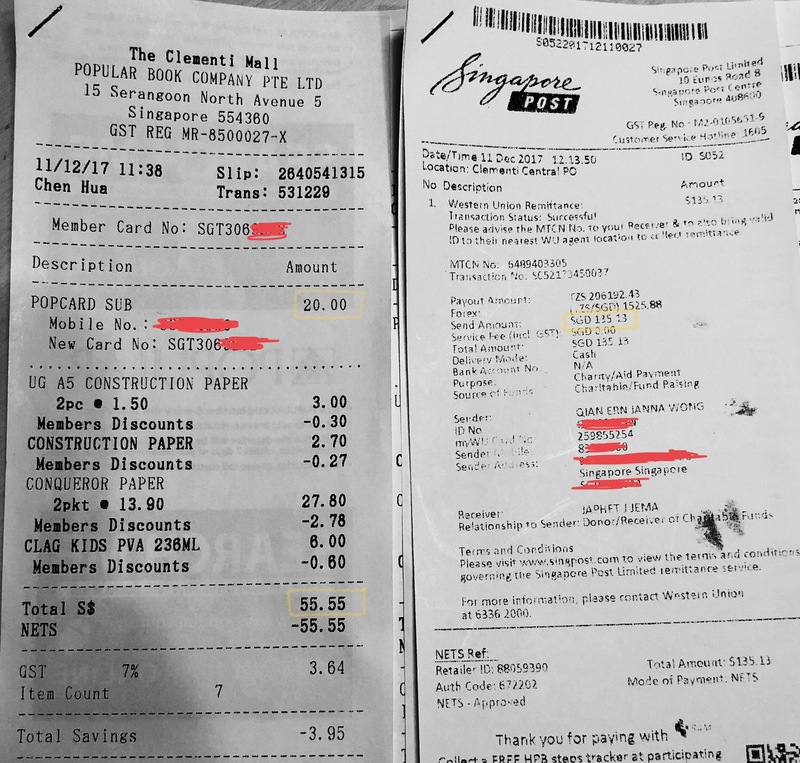 In the receipt shown below, the total came up to S$55.55 because S$20 was spent in my personal capacity on a membership card with Popular for future discounts. I will be blogging about my time with Tamar Village soon so do look out for that. The money was spent on 20 kg rice, 20 litres cooking oil, 25 kg wheat flour and 100 kg maize. Pictures and more info on the orphanage will be provided in another blogpost. Indiegogo just transferred the money to me so I am now able to provide the exact amount. For a long time, I’ve dreamt of changing the world. I cringe (so much) as I say this because it sounds ignorant and idealistic. If I ever hear someone talk about changing the world, I’d probably roll my eyes. What do you want to change? Where would you begin? If you do begin, how effective would your actions be? How much closer would it bring you to your almost unattainable goal and in relation to that, would it still be worth doing? After all, if you want to change something, it usually means doing something different and changing the world often entails some form of going against the flow. Imagine what it’d take to successfully pull that off! So naturally, I thought I’d take the easy way out. If I wanted to do something about poverty or the environment or any other cause I care about, why not donate money to a charity or volunteer with an NGO? I thought it was a rhetorical question until I found myself actually debating why not. The summary of why not is as such: transparency and impact. When I was looking for a charity to donate to, I wanted to maximise social impact per dollar. After hours of research, I stumbled upon givewell.org, which confirmed my suspicions regarding the lack of transparency in most charities. The usual scenario is that I am told where the money goes but I am not shown where the money goes. This is a major dealbreaker for me. If my donation is not being put to good use, then the impact of my donation would be severely limited and I don’t even have a lot of money to donate to begin with as a full-time student. Even if I do find a charity I trust completely, how do I know if the works of the charity are truly good for society? For example, when I was 18, I volunteered with an NGO to give out care packages to those living in one-room flats. I was incredibly shocked to find that some of the residents began to compare what they got with others. “How come I didn’t get any rice?” One even got angry his name wasn’t on the list to receive a care package and demanded for one. Where does this sense of entitlement come from? Do we really want to build a society where people expect handouts? Someone once told me that people are very good at throwing money at a problem, believing it will go away. Imagine the rich becoming richer at the expense of the poor then the rich claiming that out of the goodness of their hearts, they regularly donate to the poor. The poor then gets so used to this system that they become complacent. Now, I’m not saying that this is 100% the case but the point is that something is very wrong with the entire system and some forms of charity could perpetuate such a system if we are not careful, causing more harm than good. Now I’m left with 2 options: I could volunteer my time with an NGO or just start my own charity. Now, I am sure there are NGOs that tackle all my concerns laid out above but I figured that time spent looking for that one NGO would perhaps be more efficiently spent designing my own. Besides, if I do volunteer and go into the field to do missions etc, I believe that my impact would be limited by my own power and capacity (or rather the lack of it). Thus, if I want to go for maximum impact, I figured I would have to attempt to mobilise the ‘powerful’ and make up in numbers. After all that deliberation, I found myself in a serious bind. The “easy way out” has really really low probability of turning my ideals into reality, given my limited power and capacity. That means I would either have to live with: (1) not doing anything substantial and never realising my ideals; or (2) doing something big and possibly still not realise my ideals. I thought I’d rather hold on to a bit of hope and bet it all on (2). So I took a big leap in October 2017, under my lecturer’s guidance, to kickstart my own social project called The Necessary Good (more details in the next post). This project entails putting myself out there, baring a part of me and quite a bit of socialising; all of which scares and drains me at the same time. But I guess it beats my alternative, that is, whining about the world being the way it is yet doing absolutely nothing to contribute to my ideals.